SUPERVALU HAS CEMENTED its place as Ireland’s top supermarket, taking advantage of the pre-Christmas shopping surge. According to figures released by Kantar Worldpanel in Ireland, SuperValu has built on previous strides throughout the year to grow its market share even further in the 12 weeks ending 6 December. SuperValu overtook Tesco as Ireland’s most popular supermarket earlier this year and after sales growth of 3.7% now controls a 24.7% share of the grocery market. Rival chain Lidl posted the strongest sales growth in the same period and since this time last year has increased its sales in the Irish market by 10.6%, which represents a further 37,000 shoppers through its doors. David Berry, director at Kantar Worldpanel, said that despite the figures showing some supermarkets are making strides, “it hasn’t all been plain sailing” for all chains nationwide. SuperValu pipped Tesco to the title of Ireland’s premier supermarket earlier this year, with the English-owned chain witnessing a reduction in value sales during the same period despite a growth in the numbers of items shoppers are adding to their basket. Elsewhere, Dunnes Stores continued to show sales growth during the same period, with an increase of 3.6% and its market share growing to 23.8%, closely behind SuperValu and Tesco. December is a bumper month for supermarkets and chains nationwide, with SuperValu expecting to sell over 100,000 turkeys and over 200,000 hams in the month of December alone. Berry said as we creep closer to Christmas, retailers can expect an even further boost as consumers plan their traditional big Christmas shop, with data also showing that shoppers are stocking up on treats for the holidays. Confectionery, crisps and snacks have all seen double digit growth in shopper spend when compared with last year, helping to increase overall grocery sales by 2.5%. Such strong growth is an early indicator that Ireland’s retailers could be in for a bumper Christmas. 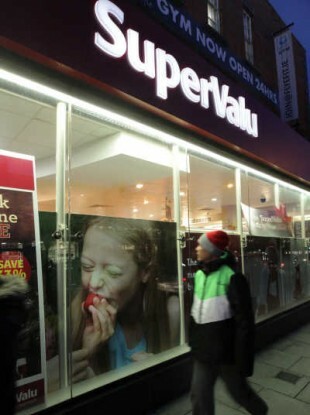 Commenting on the Kantar Worldpanel figures, Martin Kelleher, managing director at SuperValu, said they are pleased with the growth of the chain in 2015 and their continued ability to offer something unqiue to their customers. We are able to differentiate ourselves from the competition with unique selling points like having butchers in every store to provide expert advice, providing locally produced Food Academy products and an unrivalled level of customer service. Email “There's only one winner in the battle between SuperValu and Tesco”. Feedback on “There's only one winner in the battle between SuperValu and Tesco”.